The state&apos;s 2008 Capitol holiday ornament is now available. 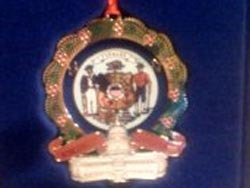 This year&apos;s state capitol ornament features the state seal and coat of arms. It&apos;s the fifth in a series offered by former state Revenue Secretary Cate Zeuske, who says 2,000 are available. The ornament carries a $16 price tag and all proceeds go toward preserving the state Capitol. Zeuske says a price increase was considered, but officials wanted to keep the price within reason for those who want an ornament. The ornament can be purchased online from the Wisconsin Historical Society&apos;s website.